We don't just GROW our plants, we KNOW our plants! We offer detailed planting and growing guides, we have a wealth of information on our web site, we attend trade shows, and we talk to our customers when they need guidance. We have the knowledge, and we share it. We are so committed to providing the best plants that we have state of the art lab, greenhouse, packing and shipping facilities. Our fields are maintained to the highest standards. We offer a very broad selection of berry plants, including over 20 varieties of both Strawberry and Raspberry plants. We have offerings for early, mid, and late growing seasons. We have you covered! We don't just sell the best quality plants, we pack them with the utmost care and ship at the best time for your growing zone. Our customers receive dormant, bare root plants in the best possible condition to ensure growing success. We treat each order with care, and you'll know it when you receive our plants. We strive to bring you the best plants on the market today. We provide you with the most complete instructions for success and deliver your plants to you on time. In the unlikely event that there is a problem with your order please notify us immediately. We want you to be 100% satisfied. 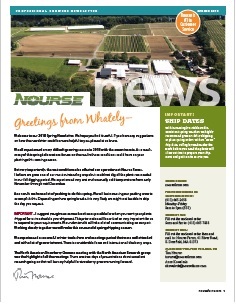 At Nourse Farms, we don’t just sell berry plants, we care about the success of every customer. Our customer service is second to none. We have a specialized staff with in-depth industry and product knowledge, and we strive to educate our customers as well. Whether it’s asked via email, letter, or a phone call, we take the time to answer any questions that our gardeners have. The vast selection of plants we sell also sets us apart. We take great pride in growing and offering a broad range of varieties. Our goal is to accommodate gardening needs across the country. We are continually testing and adding new varieties to our offerings. Why Dormant Bare Root Plants? We sell dormant bare root plants (sleeping plant with no soil around the roots) because years of experience have shown us that they will establish readily in your garden. Upon first glance, you would wonder how these roots can prosper for you, but they will perform very well. We pack the bare roots in moist paper, place them in plastic bags to conserve moisture (except asparagus & horseradish) and store them in boxes in our state of the art coolers at 28° until they are shipped to you. We schedule our shipments to customers so that plants are received by Friday of each week, and plants aren’t left sitting on trucks over a weekend. It’s important to plant immediately upon receipt. Please refer to our Planting Guide or our Planting Tips for detailed instructions.